problem is that the sleep study I did 13 months ago I weighed 275, and my pressure setting was determined to be 10 , dropped from 14, now I am back up to 305 310 in which that sleep study and weight were in align with the 14? I did get a new mask that fits perfect and full face smaller just covers the mouth - no seal problems like the quattro pro. Commercial Link Removed, instead search Supplier #1 for AirFit F20 Cpap Mask. You are correct. Both the Airsense 10 Elite and Autoset are full data capable. The only difference is the Autoset can be set to a either a pressure range or single pressure, whereas the Elite is a single pressure only. The model to avoid it the Airsense 10 CPAP. If you have anything other than the Airsense 10 CPAP, download SleepyHead to obtain detailed information of your sleep therapy. (06-07-2017, 11:39 AM)Crimson Nape Wrote: You are correct. Both the Airsense 10 Elite and Autoset are full data capable. The only difference is the Autoset can be set to a either a pressure range or single pressure, whereas the Elite is a single pressure only. 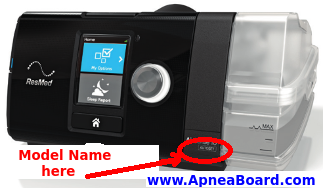 The model to avoid it the Airsense 10 CPAP. If you have anything other than the Airsense 10 CPAP, download [url=http://To download ----> CLICK HERE ./]SleepyHead[/url] to obtain detailed information of your sleep therapy. Thank you as always (from the great staff here and members) for the rapid response. i am pretty sure that I have the Elite as it came with instructions on how to obtain sleep data from the resmed/app. No it won't at this time. Are you allowed to install personal software on your work 'puter? The model I do have has a SD card slot...I guess I should have asked more ? 's but the tech doing the "training" said that I could view data on how I sleep so I hope that means I got the elite. The newer AS 10's aren't being shipped with a SD card installed. Any SD card 2gb or larger is all that is needed. You'll be hard pressed to find one as small as 2Gb now anyway. A lot of us use the Toshiba WiFi card so we don't have to keep transporting it to and from the computer. For me, I'm just plain lazy. and "AirStart" anything = brick. I can save the chromebook for my niece for a birthday present - really at home I just surf the web and use it for netflix etc..